japanese paper artist terada mokei has developed ‘1/100 architectural model accessories series no.6 new york’. the work is an entirely constructed-from-parchment representation of a bustling new york city subway station created at a 1:100 scale. ‘no.6’ is sent flat by the artist to be built by the person receiving his work with the size of the rectangular kit measuring 104mm x 148mm. each component is removed from the rectangular frame and glued into place. this functional art piece may be constructed in the context of an architectural model, enhancing the environment of the potential building, or as a miniature model of one of the world’s major metropolitan zones for display in his/her home. 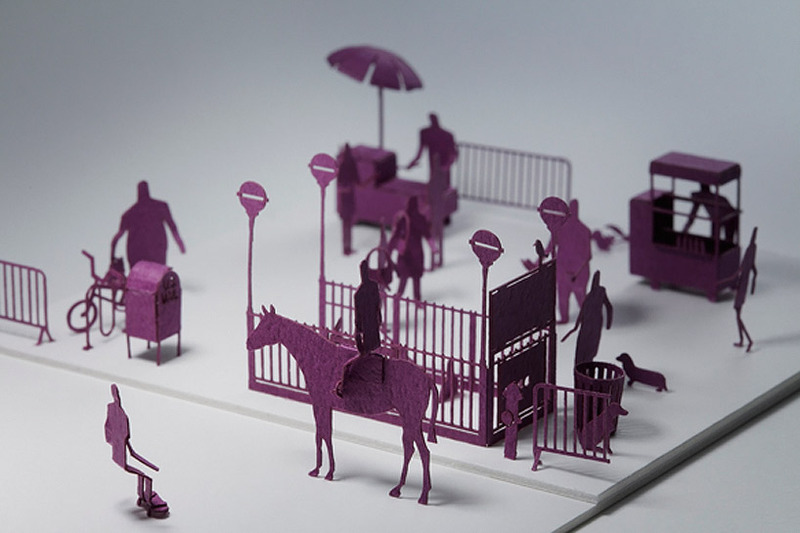 the scale paper model series contains animals such as squirrels and dogs, food typical to the streets of new york city such as hot-dogs and pretzels, pedestrian, cyclist and skateboard traffic, a police officer on horseback, and the necessary structures of a subway station such as an entrance, garbage cans, barricades, US mailbox, and people of various sizes. I love it! Very nice indeed!